So, that brings us to how the craft room looks today. Are you ready? Are you ready? huh, huh, huh, huh, huh? Okay, well, come on then! Does that font scream Vicki Lawrence or what? If you have no idea what I’m talking about…I’m not sure we can be friends. Anyway,to the left you will see a big cabinet. One half of it has drawers and the other half is sliding shelves. On top, notice the funky blue genie lamp given to me by my dearest mother-in-law who was going to get rid of it. 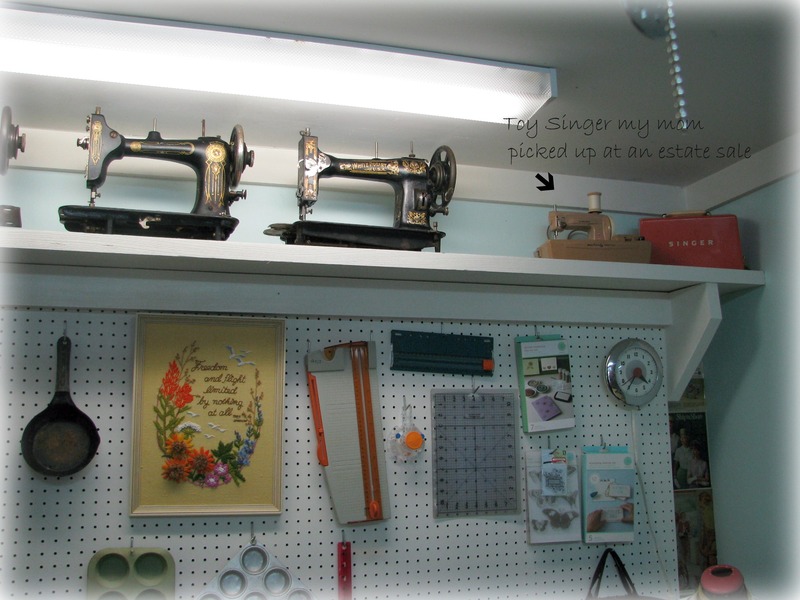 Then, the white sewing cabinet is my standard go-to Kenmore machine. My mother gave me that machine in 2000, and it was her old cabinet. More on that in a bit. 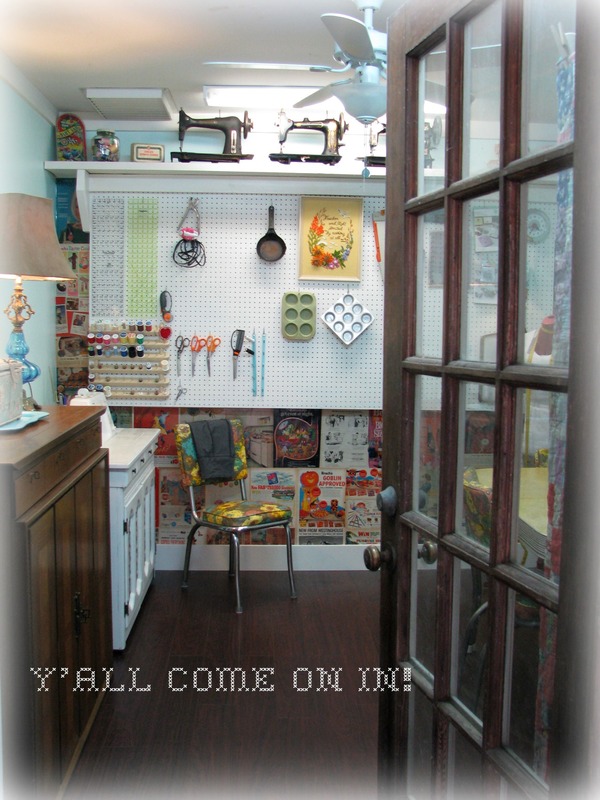 Don’t you just love pegboard? Sigh. Here is my table and chairs that I got for 100 bucks off of CL. When I first saw it, I just couldn’t decide if I loved it or hated it. I had to look at the ad about 10 times before I decided I’d call about it. As it turns out, it fits perfectly in here. Esmeralda was the dressform given to me by my mom’s friend. I have padded her to look more like…me. Yes, I look like an hourglass. Hush up. And there’s my happy little blog on my laptop. I was thrilled that I could actually get signal way out here. Here is that metal rack. 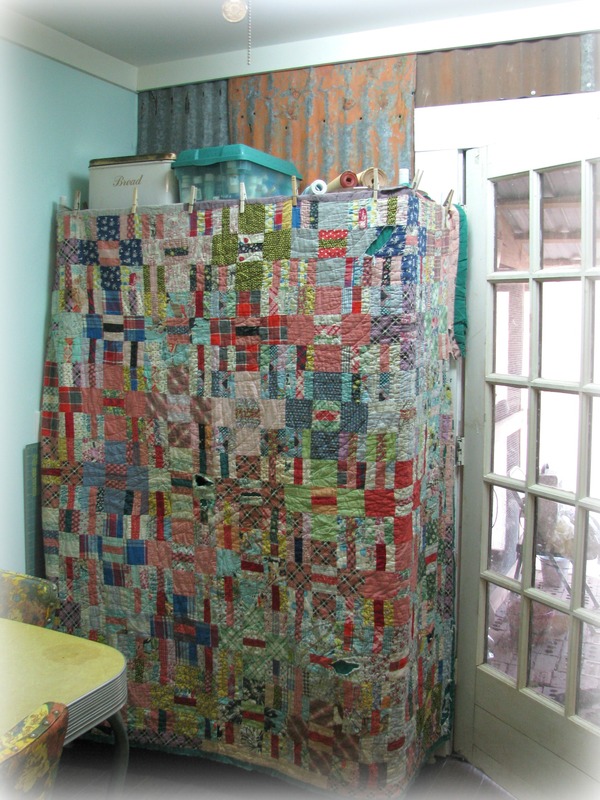 I covered it with my $3 garage sale quilt via clothespins to hide all that ‘Junque’ that it contains. On the lowest rack is my batting/Polyfil/fabric scraps which are stuffed (!) into vintage suitcases. Yeah, I was too lazy to show you that. I also spray painted my cheap little radio turquoise and that’s where it sits. 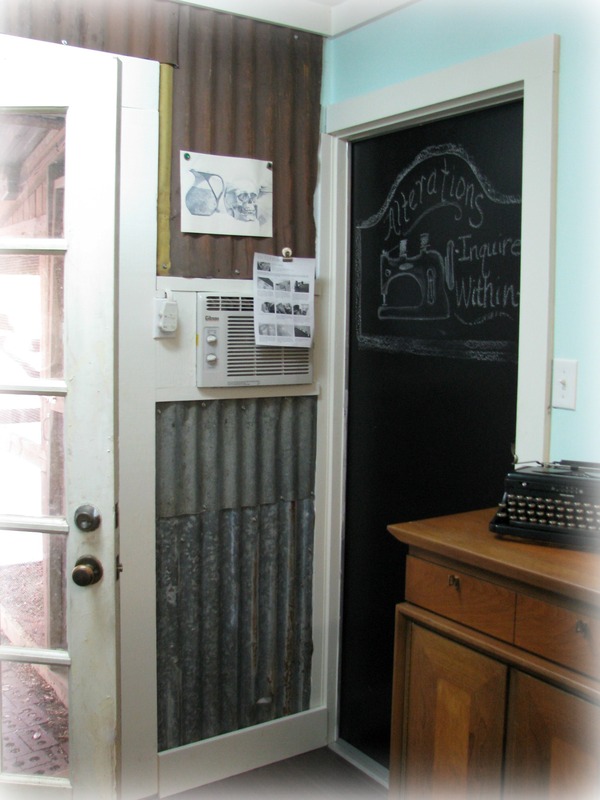 My chalkboard door and my tin wall. I drew that picture (pointillism study in art class back in ’99), and I just really like it, so I stuck it there. I doodled a sign on the door just…because. See my old typewriter? I own two. Love ’em. This was my mom’s old sewing cabinet. I should title this pic “Pimp My Cabinet”. A week ago, it was that hideous speckled 1970s brown. Now it is Dover White and I sanded all the corners. 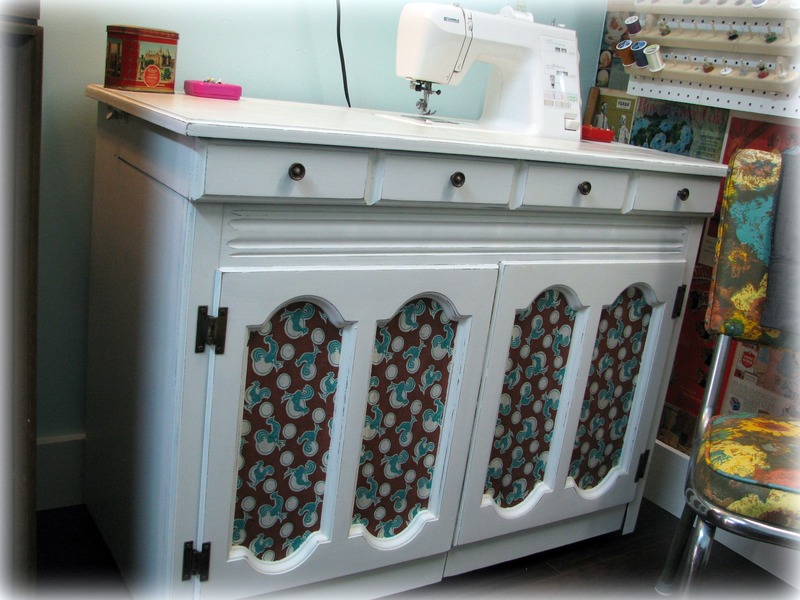 I decoupaged the cabinet doors with vintage fabric from my Mamaw’s attic. Coming soon: Glass knobs. I also applied clear Contact paper on the top to prevent smudges. The paint that I had was satin, so it tends to kinda absorb dirt. Detail of shelves/pegboard. The clock was a present from my Papaw. And here’s my favorite ad on the whole wall. 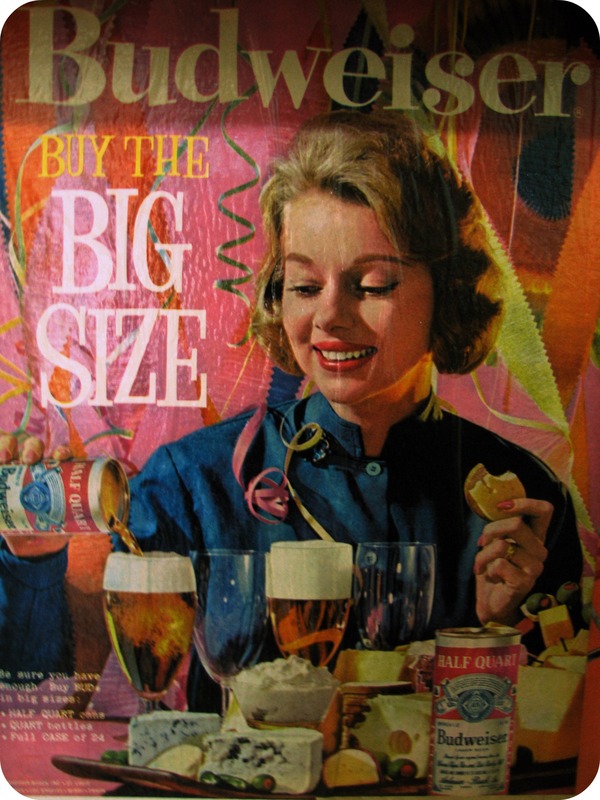 Because nothing screams class like fine imported cheese, hors d’oeuvres, and cheap domestic beer of the half-quart variety. You have to love the 60’s. Hope you enjoyed! Of course, I’m not done. 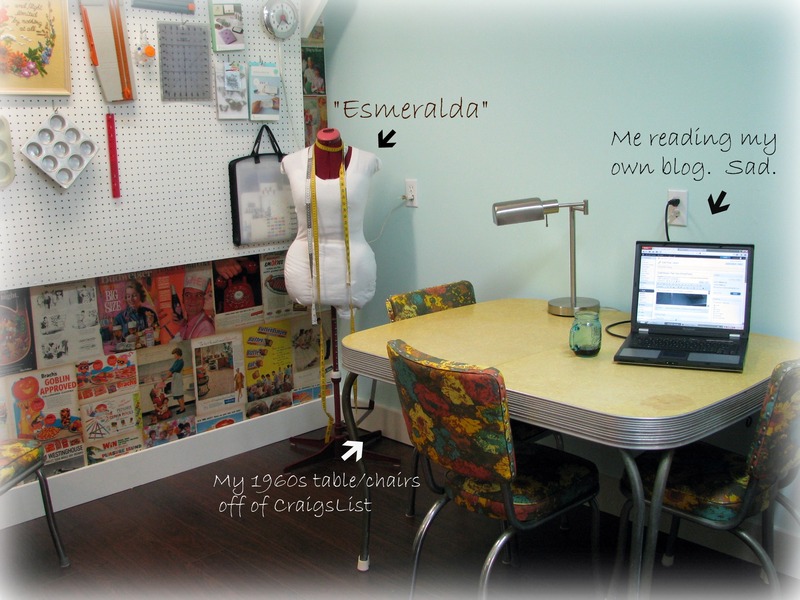 Not done until I can fill the walls with tacky vintage items that no one else in their right mind would want! Love, love, love and am pinning it on Pinterest!!!!!! WOW! What a transformation! You have done an amazing job . . and I love your sense of humor!! Thanks! I try to be funny…. Wow, what a transformation! I like the old Singers. I wish I still had my first toy sewing machine. Lovely! That quilt is a great garage sale find!